Check out our tips on what not to do when renting your first apartment. There is a long list of things that you know you should do when getting your first apartment, but the list of what not to do is just as important! Moving into an apartment can be overwhelming at times, but we have a few tips on how to ensure the process is as stress-free as possible. Continue reading to learn about a few things you shouldn’t do when renting your first apartment. Furniture shopping is not an easy process, as no one wants to live in an empty apartment for an extended time. However, buying everything at once is not necessary, and be a very expensive decision. Instead, start with the essentials, such as a bed, couch, and kitchen table, then gradually look for other pieces. If you go out to the closest store and try to buy everything at once, you may end up with pieces that you don’t really love, and will likely miss out on better deals. Shop around for coffee tables, rugs, and chairs until you find the perfect piece that fits with your design and budget! When moving into your first apartment, there is a good chance that you are on a tight budget. While it’s great to find deals wherever possible, there are a few items that are worth a larger investment. For example, you will spend every night on your mattress, and the majority of your afternoons on the couch. It is so important to invest in a high-quality mattress, as a good night’s sleep is crucial for your mental and physical health. You also want to buy the best couch you can afford, as the higher the quality, the more use you can get out of it before it needs to be replaced. It’s common to be nervous about decorating a rental apartment, especially if you do not know how long you’ll be staying. 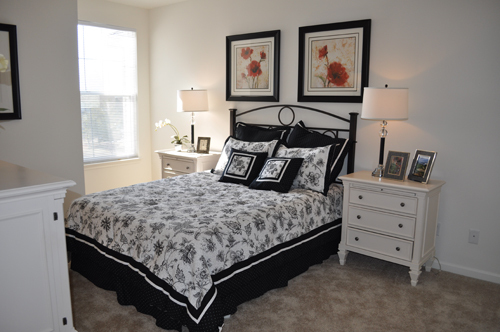 However, your apartment is your home and should feel like your own personal sanctuary! Don’t be afraid to ask your landlord about painting the walls or any other minor changes. If they don’t allow paint, you can still make a room your own with wall art, rugs, lighting fixtures, and decor. This entry was posted on Friday, September 21st, 2018	at 3:40 pm	. Both comments and pings are currently closed.